Sprue syndrome is a condition in which the lining of the small intestine gets inflamed. There is improper absorption of the food. The main cause of inflammation is eating gluten that causes an allergic reaction. Gluten is mainly found in cereals such as wheat, barley, rye and oats. The main function of the small intestine is absorption of the food and it is done by the villi present in the small intestine. Villi increase the surface area of the small intestines for absorption of the food. Sprue syndrome is an autoimmune disease because the immune system of a person affects adversely when a person consumes food containing gluten. It starts damaging the villi of the small intestines thus leading to the symptoms of sprue syndrome. In this condition, though a person eats food but he/she does not gain weight and become malnourished. It may develop during any period of life. People suffering from sprue syndrome may also suffer from other auto immune disorders such as Addison’s disease, rheumatoid arthritis, systemic lupus erythematous, etc. It is important that our body should perform natural detoxification to get rid of waste materials. When small intestines get affected other digestive organs also suffer and condition may become worse if not diagnosed and treated properly. Some people suffer from constipation and other may have diarrhoea whereas many people do not have any problems with stool. People may complain of abdominal pain, flatulence and indigestion. Children and adults suffering from sprue syndrome may have reduced appetite. Lactose intolerance is a common symptom in people suffering from sprue syndrome. Weight loss is common despite of eating good diet. Stools may be foul smelling and sticky. Divya Gashar churna: This herbal remedy helps in the treatment of sprue syndrome. 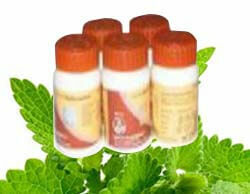 It gives quick relief from diarrhea and other symptoms of sprue disease. It helps in boosting of immune system. It is an excellent remedy for flatulence and indigestion. Divya Bilwadi Churna: This is one of the best herbal remedies for diarrhea. This herbal remedy is a natural cure for diarrhea. It is an excellent natural remedy for sprue disease. It helps in cleansing of the blood by removing the waste products from the body. Divya Shankh Bhasm: This is a wonderful herbal remedy for the treatment of sprue disease. It helps in the treatment of inflammation of the intestines and gives relief from diarrhea and other symptoms. It helps to boost up the digestive organs. It also helps in removing the waste products from the body. Divya Kapardaka Bhasm: It is a useful remedy for digestive disorders. It helps by removing the chemical substances from the blood. It supports the digestive organs and helps in normal functioning. Divya Mukta Shukti Bhasm: It is a natural remedy for the treatment of sprue disease, diarrhea and for cleansing of the small intestines. It removes the harmful substances from the body and gives relief from pain and flatulence. Divya Kutajghan Vati: This herbal remedy may be used for the natural treatment of sprue syndrome and chronic diarrhea. It provides relief from chronic constipation. It reduces the sensitivity to gluten. It is a natural cure for diarrhea. Divya Chitrakadi Vati: IT is an excellent remedy for pain in the stomach. It provides quick relief from pain and flatulence. It also helps to improve the digestive functions. It prevents the villi of intestines from getting inflamed by eating gluten. Drinking more water helps in the treatment of sprue disease. Water is a natural detoxicating substance and helps in removing the waste products from the body. If you are suffering from constipation, then you may increase fibre in your diet. Take fibrous diet to get rid of constipation. Ginger is a useful home remedy as it posses anti-inflammatory properties. Add ginger in daily diet. One may drink ginger tea to get rid of inflammation of the intestines. Ginger also helps in boosting up the immune system. Turmeric is also good for boosting up the immunity. One may use turmeric in preparation of food. People suffering from sprue disease should avoid foods that contain gluten. One may try eating more fruits and vegetables. Regular exercise also helps in boosting up the immune system. One may also do meditation and yoga to boost up the immunity. Meditation also helps in reducing stress. You should check the labels of the food products. Avoid any food products that contain gluten. One should pay attention to the foods before consumption because slight exposure to gluten can aggravate the symptoms of sprue disease. Rice, quinoa is useful for people suffering from sprue disease. If you are suffering from diarrhoea, then you may soak some uncooked rice in a bowl. Keep it for half an hour and drink this water two three times in a day to get relief from diarrhoea. One should take proper sleep to avoid any mental stress because mental stress can aggravate the physical symptoms.